Fine wine and spirits are more popular than ever, but counterfeiting and fraud are also on the rise. In fact, a Vandagraf report estimates that roughly 30% of the alcohol consumed globally is believed to be fake. SICPA has partnered with Labeltronix to seamlessly integrate unique security features into label designs without the need for special equipment or modification of production processes. SICPA's multilayered security solutions help fight counterfeiters while offering beautiful, attractive design elements that make a bottle stand out on the shelf, enticing consumers to buy it. 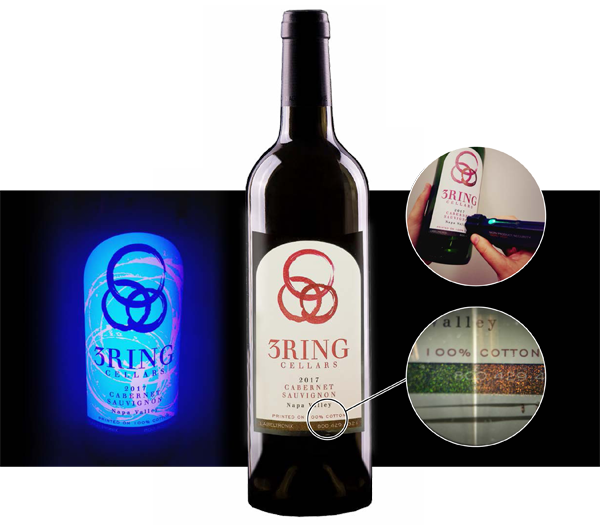 These features can boost a bottle's appearance, attract potential buyers, and act as proof of authenticity and quality. From overt security features detectable by the naked eye to invisible features that must be authenticated using forensic techniques, SICPA has proven solutions to help you protect your brand. SICPA OASIS®: An optically active security ink incorporates an overt color shift and semi-covert properties that become visible using light polarization filters. Invisible fluorescent: Covert ink that fluoresces under ultra-violet (UV) light. Machine-readable: This covert feature is completely invisible to the naked eye. It must be authenticated using a portable, hand-held device.